If you’ve read my reviews recently, you’ll notice a theme: extremely rural Scottish courses. Reay perfectly fits that mold as it’s the most northerly 18-hole course on the British mainland. 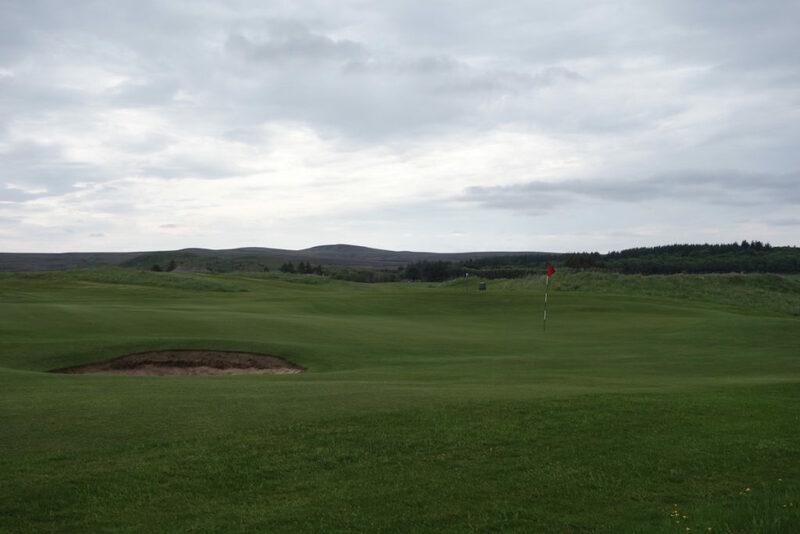 If you thought that Royal Dornoch was way up north, Reay is 2 hours north of Dornoch! I made the journey to Reay as part of my trip on the North Coast 500 – a 500-mile road trip through the Scottish Highlands. It was as rewarding and enjoyable a golf trip as I’ve ever had. Reay was founded in 1893 and its history is very interesting. 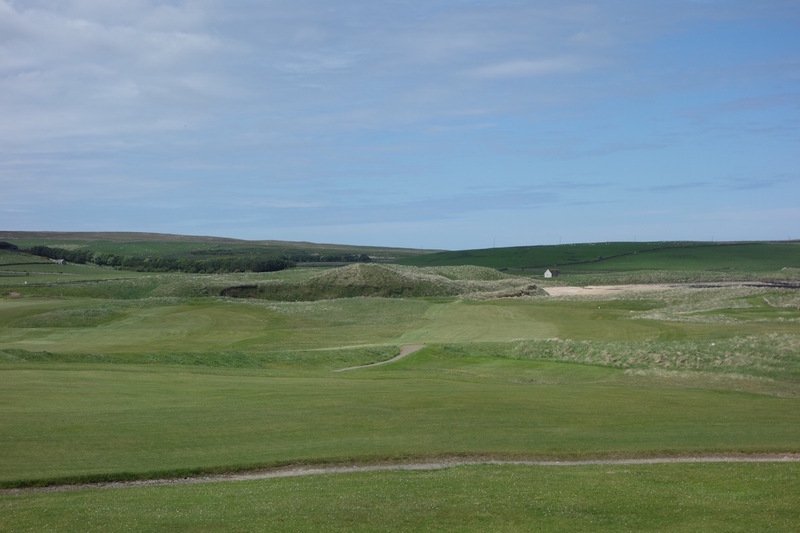 The course at “Sandside” – the site of Reay Golf Club – started as a 12-hole course laid out by the landowners. 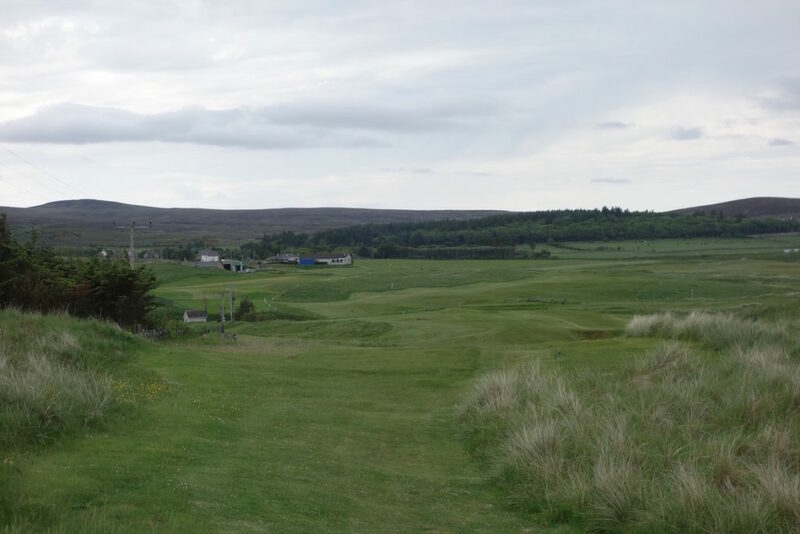 The course was available to locals who paid a small subscription until the early 1930s, when the owners sold the land and turned over management of the course to the local government. The subscription price was raised for the local golfers and a superintendent was hired to maintain the course. 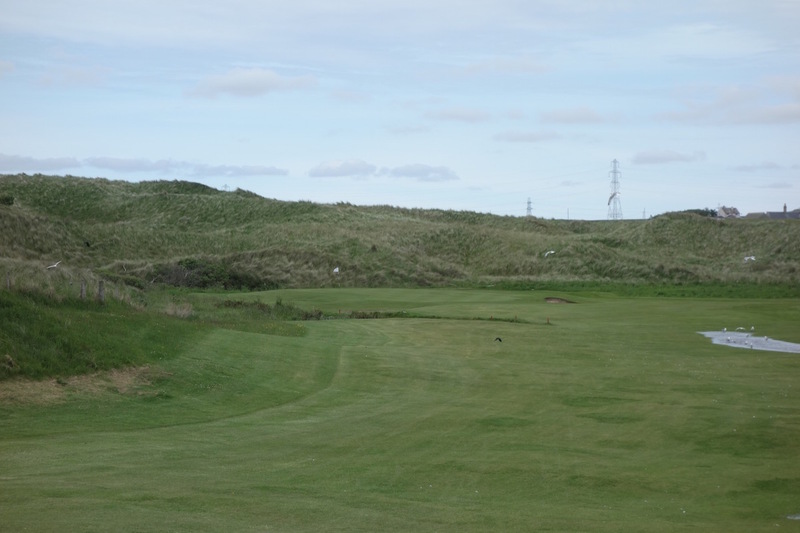 James Braid was even asked to redesign parts of the course and expand it to 18-holes in 1933. Braid drew a new routing and sent a letter of recommendations and changes to the area’s council. 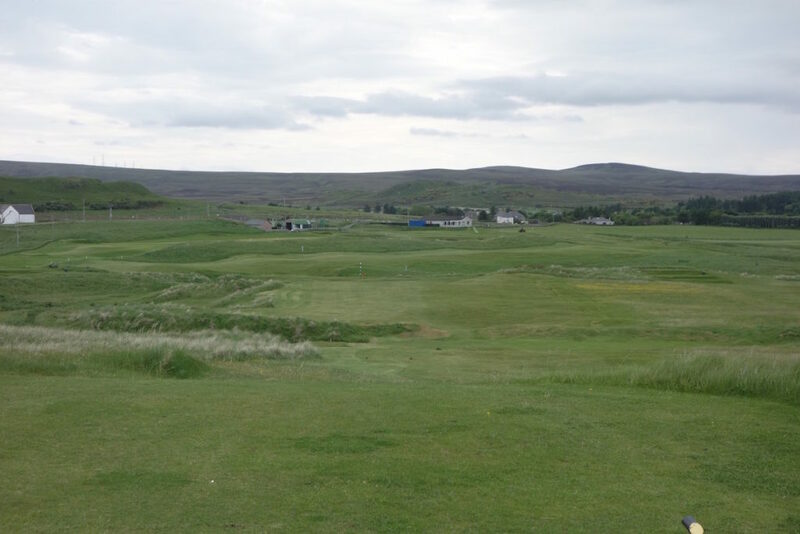 The Great Depression’s effects hit the rural north of Scotland shortly after Braid’s visit and the course closed in 1940 due to an exodus of locals. The golf course grew back into a grassy field and the clubhouse eventually blew over in a windstorm. 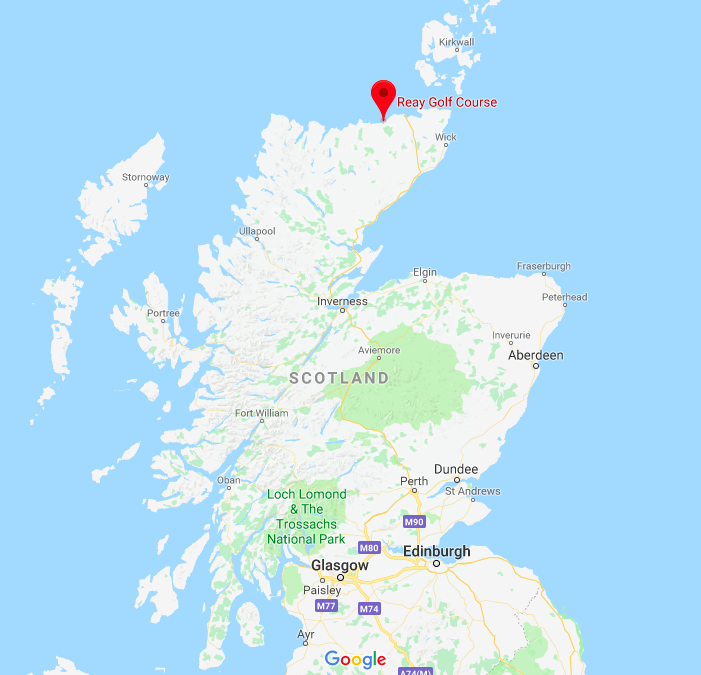 In the early 1950s the British government decided to establish two nuclear facilities at Dounreay, located only a few miles from the old golf course site. The creation of this facility brought a large workforce that revitalized the area. By the 1960s a group redeveloped the golf course based on Braid’s plans and eventually a new clubhouse was built overlooking the course. That is the course and clubhouse we play today. The sprawling site of the nuclear facility is visible from the road as you approach Reay and it is striking in the otherwise rural and empty landscape. Dounreay has five nuclear reactors that are all in various states of decommission. The site was also used to test and develop the Vulcan nuclear propulsion system for the British submarine fleet. Most of Dounreay was decommissioned in the early 2000s, but the site is still staffed as cleanup efforts will take decades. For interesting reading on Dounreay and the task of disposing of 10,000+ tons of nuclear fuel and waste, here is an article on Wikipedia. Food for thought here: the end point of the nuclear waste removal plan is scheduled for the year 2,300. Back to golf! Reay is a par 69 5,584-yard course, and even at that length the course ate my lunch. I lost almost every ball in my bag on the cold, windy day. The rough was very thick and blind/semi-blind tee shots meant I missed fairways. Whenever I missed a fairway, the ball was almost certainly lost. 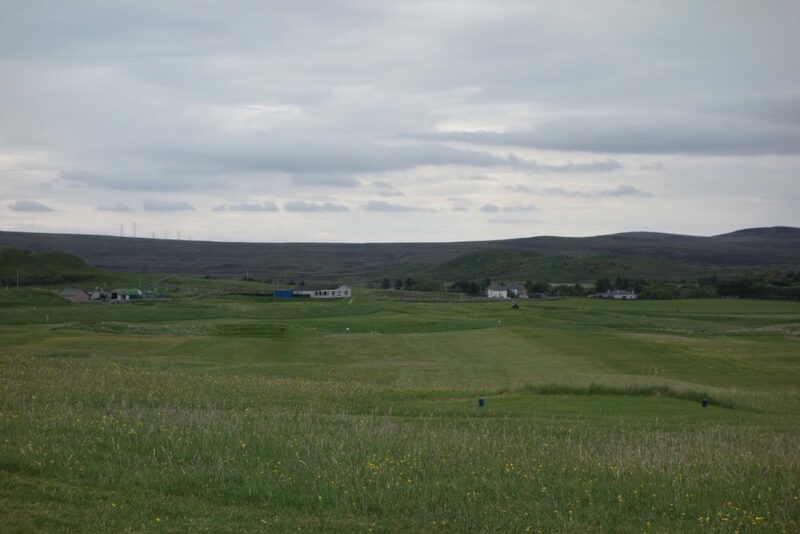 Despite my best efforts to not equate the quality of my play with the quality of the course, I did leave Reay thinking “good riddance…” It took time for me to separate my frustration from an observation of its quality. I’d love to play Reay again with the mindset that blind shots are only blind once. Another point that only hit me months after the rounds were some design similarities with Golf House Club Elie in the East Neuk of Fife near St Andrews. 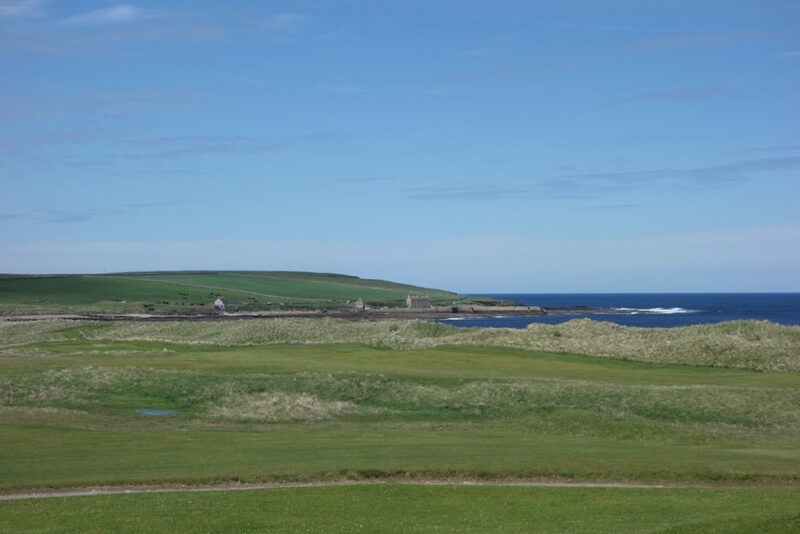 It was Braid’s hometown and home course, and I’d bet that whether conscious or not, some of Elie slipped into his suggestions for Reay. 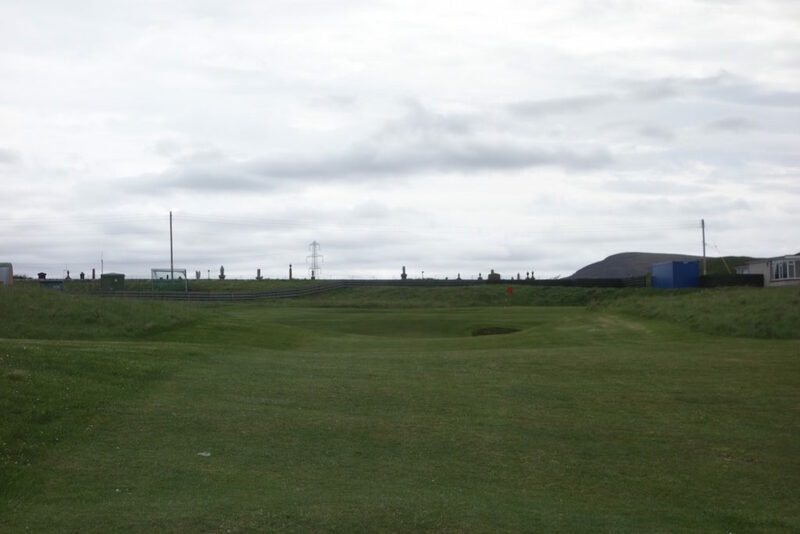 The short downhill par 4s feel like they’re straight out of the Elie playbook. Reay’s website says that the course “demands every shot in the bag,” and I agree. It would have been invaluable to play the course with a member who could have shared some local knowledge. The course has highs and lows – the best parts of the course are located in the dunes/linksland close to the beach. The less interesting land is the flatter farmland furthest from the ocean. The review below highlights the my favorite parts of the course. Hole #4 – 585 yards – “Sahara” – The first three holes ease you into the round, but the fourth is where it really picks up. 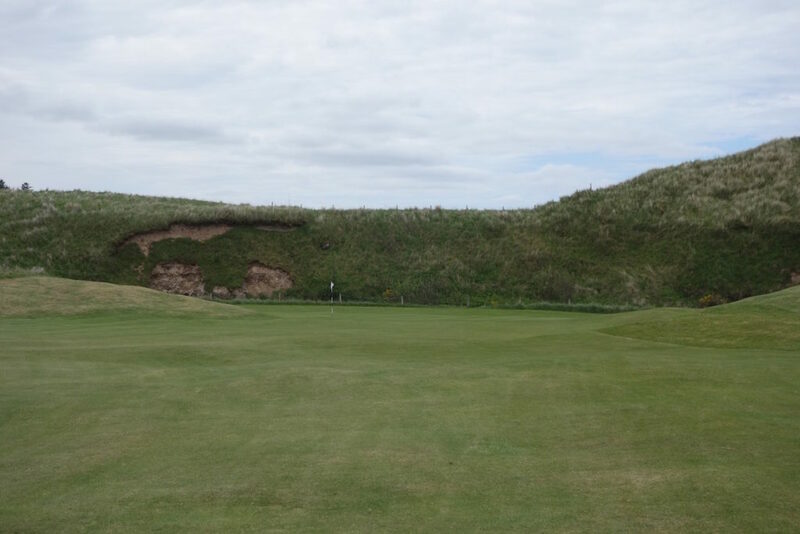 That’s particularly true at the green, which is set beneath a large dune and marks the start of the seaside holes. 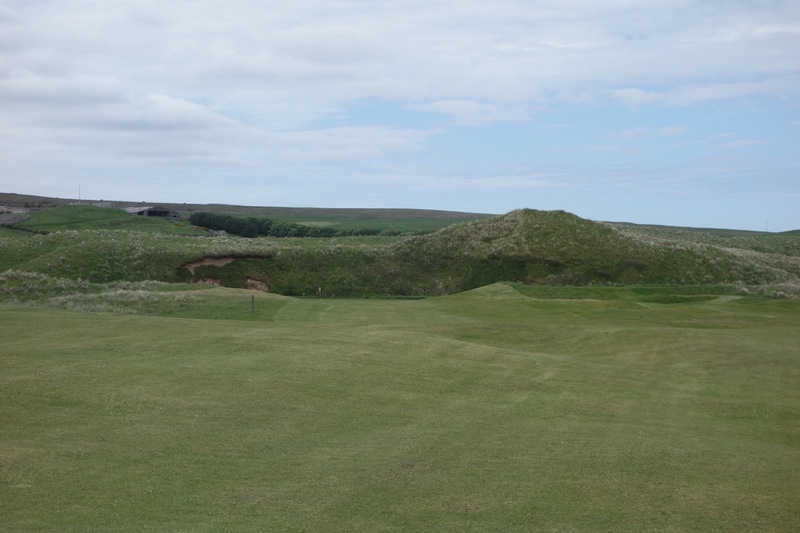 Hole #5 – 144 yards – “Cnocstanger” – Photos don’t do this hole justice. You can hear waves crashing to your left and a large beach/bay is visible just over your left shoulder. 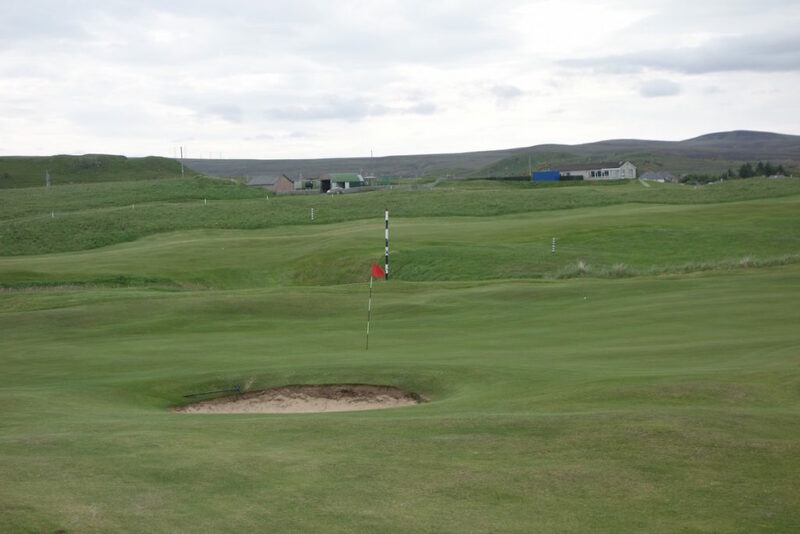 The green is guarded by three bunkers and the slope to the left kicks balls onto the green. Hole #6 – 500 yards – “Braid’s Choice” – This was reportedly James Braids’ favorite hole and it was mine as well. The par 5 curves left following the shape of the beach before it reaches a green and meandering creek set in the dunes. This green is visible from the first tee, and for the first five holes I was just waiting to play this one. 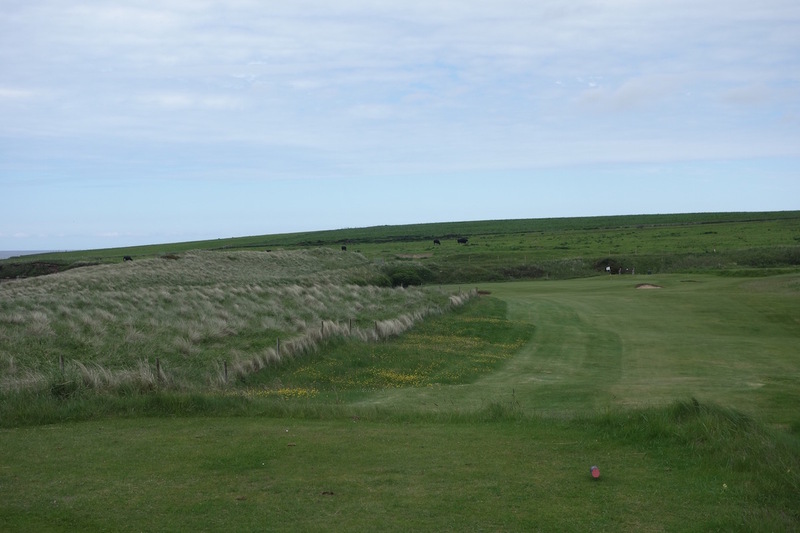 Hole #7 – 196 yards – “Pilkington” – This par 3 is the number one stroke hole at Reay. I’m not sure of another course where the hardest hole is a par 3! This beast plays over a valley and the green is surrounded by thick grass. 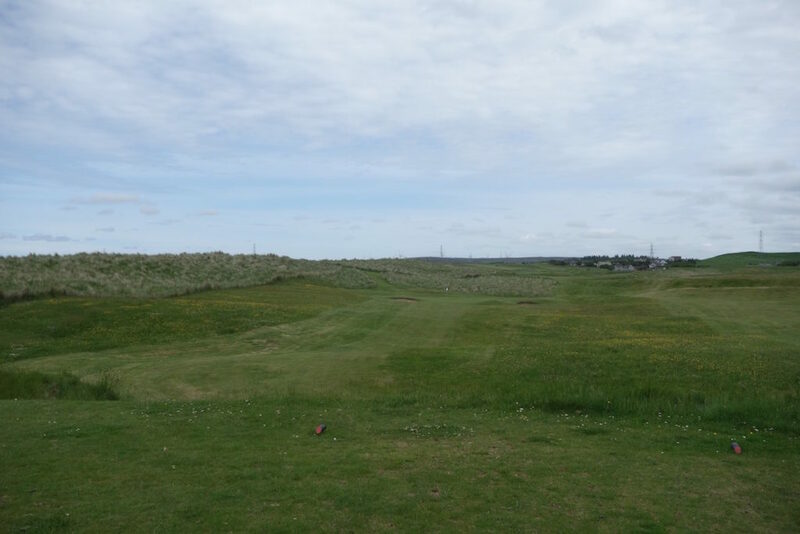 During my round the hole played dead into the wind and I punched driver from 200 yards… I lost the ball in thick rough just over the green. 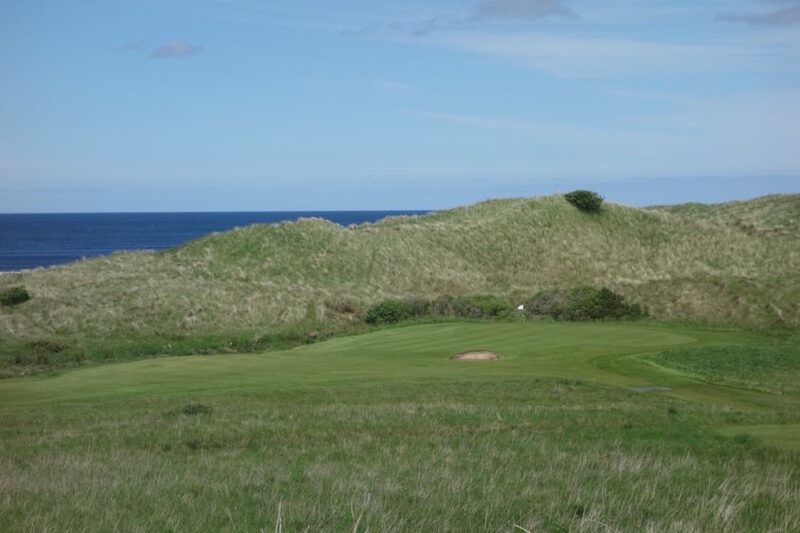 Hole #9 – 176 yards – “Chapel” – The 9th is the final hole that plays along the coastline and skirts the dunes. Playing into the wind again, this was another beast. Hole #11 – 406 yards – “Torran” – The marking post in the first photo below shows the line off the tee, after which the holes gently rolls down the the green. Any ball landed on the green will almost certainly roll off the back. 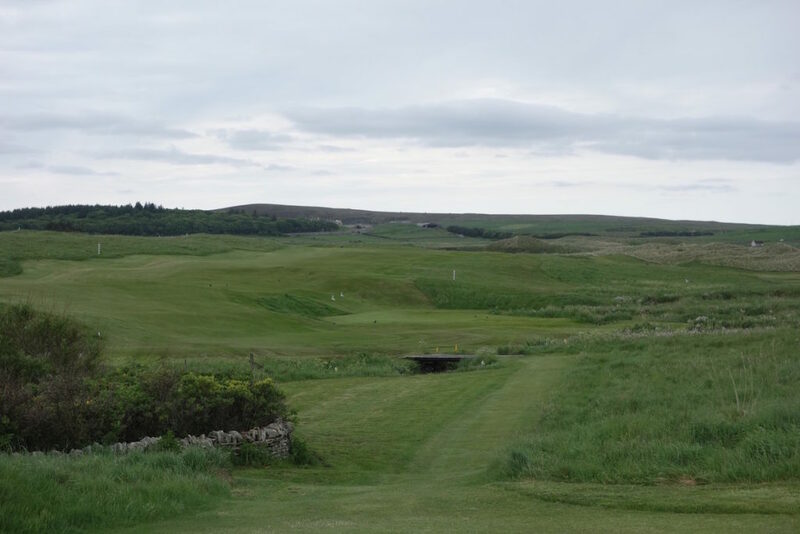 Hole #13 – 305 yards – “Spring Lochy” – If the 6th was my favorite hole, the 13th was my second favorite. The 13th is driveable and the line is the marker post behind the green. In order to hit the sunken green, players have to thread the needle between two bunkers and multiple slopes, as seen in the second photo below. 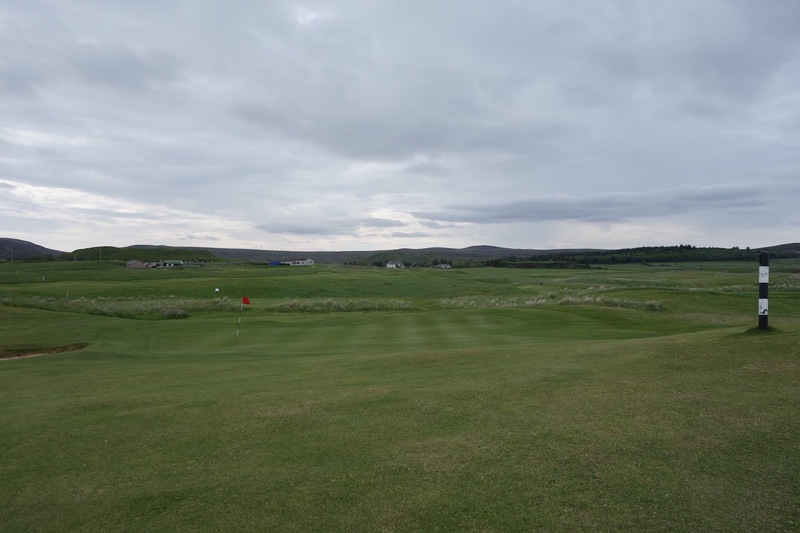 Hole #16 – 314 yards – “Reay Kirk” – Similar to the 13th, this is another short downhill par 4. This tee is one of the highest points on the course and offers a great view looking back. 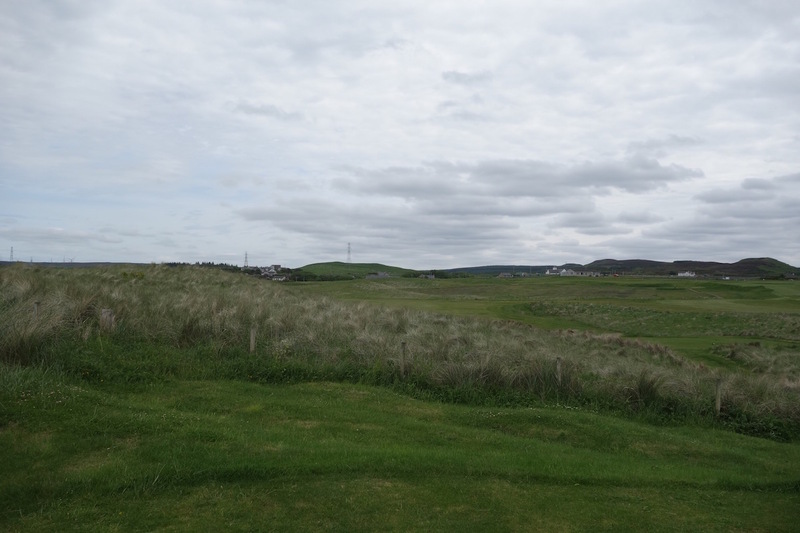 Hole #17 – 328 yards – Dossie’s Dyke – This is a hole I’d like to see again. It’s hard to pick a line off the tee, but the optimal shot splits the two white posts on either side of the fairway. The rolling green has a single bunker on the right side (the second photo below is taken from behind the green looking back toward the tee). 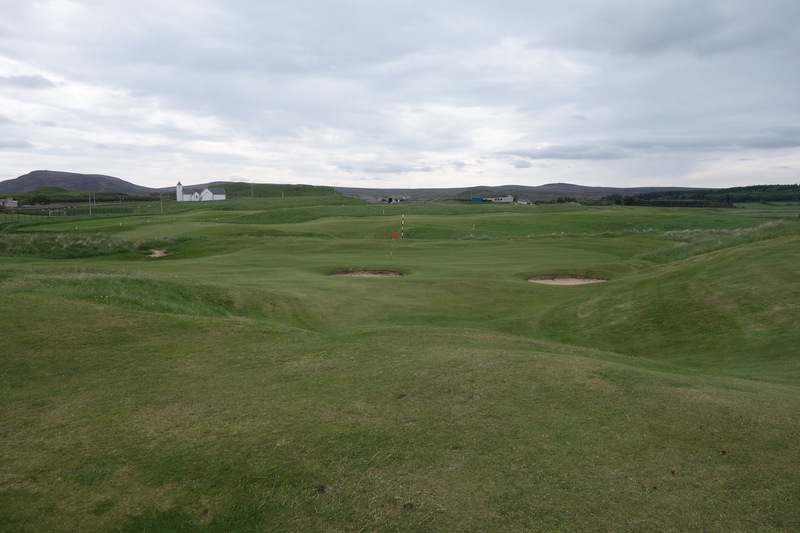 Hole #18 – 162 yards – “Clachan” – The course begins and ends with par 3s. This final one has a green surrounded by a natural amphitheater and is fronted by a single bunker and steep slope. 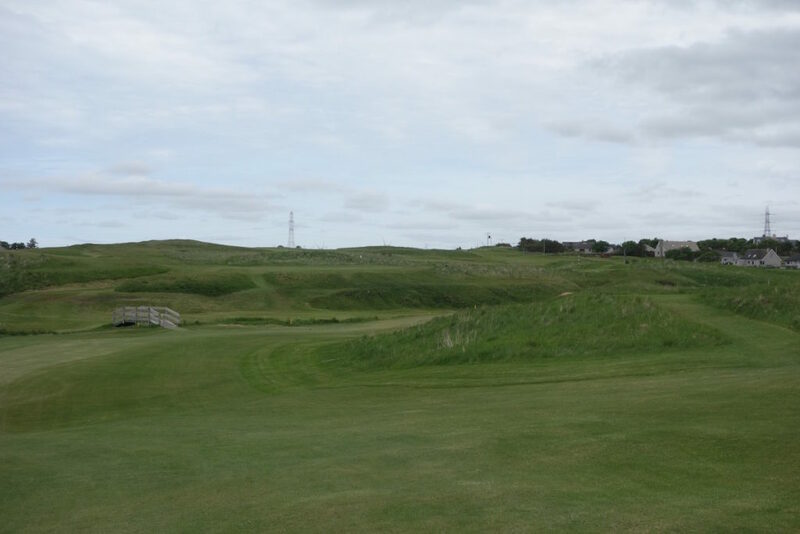 While not every hole at Reay is world-class, there are some seriously good parts of the course. The similarities with Elie might be a total coincidence, but the charm and quirk of both courses touch on what I love about Scottish golf. If you ever make the long, worthwhile journey up to Reay, play the course twice if you can! I know I will enjoy it a second time even more and I hope I get back soon. When you are back over will you try Traigh, “my” country course? I think you will love that as well. Hi David, I would love to play Traigh! I love the west coast of Scotland and need to spend more time out there exploring… whenever I get that way I’ll try to give you a shout! I like the look of those greens at 13 and 16! Reading all your reviews takes me back to to a magical summer I had up there. I played all these courses regulary. My father was up there for work. Every night we would play golf. You need to play Wick! Top writing fella. Brought a tear to my eye.